The rising generation of British jazz talent, of which there’s been such press and media interest in the last few years, is really coming of age. Here we have a leading light of this new wave, pianist Sarah Tandy and her young band of starlets launching her album . The album, entitled “Infection in the Sentence”, is an accomplished affair, having sworn myself to a streaming-only life recently I’ve done a typical volte face and have been buying LPs over the last few weeks. Sarah’s album got a good run out this morning and I’m liking it very much. Any band with Femi Koleoso is worth seeing - what an amazing drummer he, the power he exudes into the drumkit is scary. I remember thinking that about a young Billy Cobham: well-honed tight power leads to some fantastic soloing. Anyhow the gig was a stonker. Another strong JITR, with great musicians in all three parts. First up was Tomasz Bura & The Scientists. We’d seen Tomasz before as part of Beat Replacement at the Emergence Festival last September. With his own band here, but still the focus of attention with his great stage presence. He had stiff competition though from his own partner, Rouhangeze Baichoo on vocals, a very photogenic singer & dancer. Supported ably by Saleem Rahman (drums) and Kevin Glasgow (bass), this band, with its dynamic leader, is one to watch develop over the coming years. In the solo slot was Maurizio Ravalico, an extraordinary percussionist, who conjured a mesmerizing set. Leading the line, the mighty Roller Trio, and it may have been the first time I’ve seen them, although apparently they played JITR in the first year, but it may have been the one gig that I missed that year. Anyhow, better than late than never for me. Also, unexpected instrument selection for James Mainwaring (alto sax) and Chris Sharkey (electric bass) with Luke Reddin-Williams on drums, no change there methinks. They have a new album out, which I’m just getting into and loving it, New Devices. In the year the club turns 60, great luminaries of the class of ‘59 are being celebrated in a series of gigs over the year. This was the first up presented by the club’s All-Star Quintet featuring music from Horace Silver’s LP “Blowin’ The Blues Away”. One of the gigs of the year? A strong contender for sure. The Ed Jones Quartet and the explosive Lisa Fischer in a staggeringly powerful performance in front of a buzzing room at Ronnies. Her first album in 1999 was a massive favourite and got played to death, but since then, I must confess, I haven’t kept up with her back catalogue - must try harder. But live, she didn’t disappoint, supported by a fine band and two stellar backing singers, Kayla Starr and Tamika Peoples, although I couldn’t really understand why the band had chosen such low-key stage lighting; such a luminous talent needs to be seen as well as heard. Anyhow, the room rocked and I went home a happy man. Opening up on the night, was the bright young musician Braxton Cook, with a fine band. Keep an eye and and an ear out for his music. An outstanding gig, one of the best of the year at Ronnies that I’ve been lucky enough to catch. 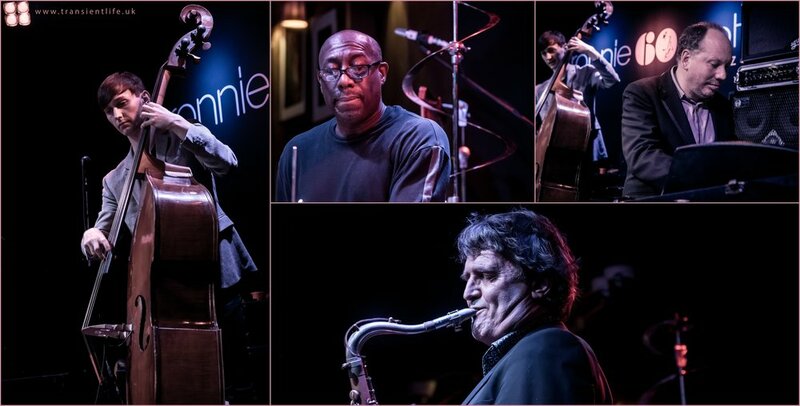 This band is full of seasoned professionals at the very top of their game: as Dave Holland commented, the first time he attended Ronnies it was before the move to Frith Street and he was just 17; that night it was Wes Montgomery. Over 50 years later, he was leading this fine band with Chris Potter, Eric Harland and Kevin Eubanks - Kevin, whom I’d never seen play before was a revelation. Top band. Don’t miss them if you get the chance. Also a big shout for the Sara Dowling Quartet, whom I’ll be making sure I check out again in the future. The penultimate Monday Jazz In The Round of 2018 - how come the years fly by with increasing alacrity? Anyhow, what a gig it was, strong in all three sets. Headlining were a band I’d been unlucky enough never to have seen before, the Jessica Lauren 4. 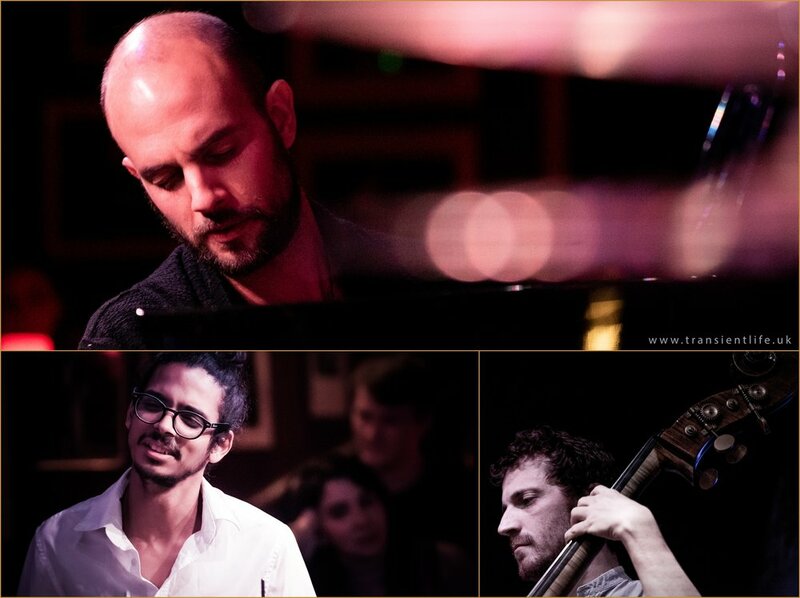 From top left, we have Cosimo Keita Cadore (drums), Suman Joshi (double bass), Jessica Lauren (keys, vocals) and David “Booie” Gallagher (percussion). Great band playing foot-tapping tunes and radiating positivity and goodwill. Nice. In the solo slot, was former headliner Jean Toussaint improvising his way through his set and slowly turning around mindful he had his audience circling him. The Cockpit offers this very unusual in-the-round experience on a monthly basis. First up were Brother’s Testatment, a fine new and young band that I cannot wait to see again playing their own gig. It was great to see Kurt Elling and his fine band back at Ronnie Scott's Jazz Club tonight. A great singer entertaining the packed-out club, starting with an a capella A Hard Rain's Gonna Fall. Great stuff. As always, there was at least one pointed political message during my time in front of the band; you wouldn’t expect anything less from Kurt. A great end to a week at Ronnie Scott's Jazz Club with the band Harriet Tubman, named after a heroine of the opposition to slavery in the antebellum US. Anyhow, the band, a classic blues-rock trio, guitar, bass and drums, but with a massive twist, heavy and meandering in a very pleasing manner. I'm going to get stuck into the back catalogue forthwith. Erm, hang on a second, that can’t be right…or can it? Doing it the Osibisa way at Ronnie Scott's Jazz Club.